Vivian Daly was 8 years old when she woke to a house fire and was put into the custody of an organization that distributed orphans to foster families out in the country. She rode a train full of other children like herself, some gathered up from the streets and gutters. She is placed into a family, but quickly finds out that she is not intended to be a child, but to work for them without pay except room and board…When the depression hits, things unravel quickly, and she finds herself bouncing from home to home, trying to find her place in the world and survive as best she can, only her able body and her wits on her side. Molly Ayer is a 17-year-old girl who has been in “the system” for many years. She has bounced from foster situation to foster situation, and she has learned that she has no one to count on but herself. She dyes her hair, gets piercings, wears gothic makeup…Whatever it takes to get people to just leave her alone. When she is sentenced to 50 hours of community service and placed in the home of an elderly woman named Vivian, she knows the whole thing is going to be a big snooze fest…But she finds that she and this old woman are not so different from one another. And an unlikely bond forms between these two strong women. 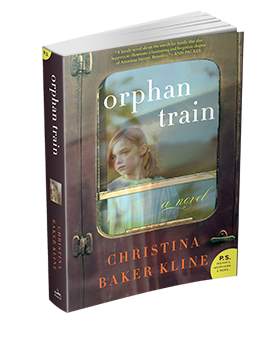 Orphan Train, by Christina Baker Kline, is a novel about the parallels and patterns in life that travel from generation to generation, the darkest sides of humanity, the people who stand up for others and the people who only care about themselves, and the pain of real life and hardship. This novel is not warm and fuzzy, although the end is very uplifting. More sensitive readers will want Kleenex nearby, as the flaws in the foster system of both generations are unearthed and exposed mercilessly. This novel is beautiful and intense, and I couldn’t put it down. Great story. Period.